An authentically styled pinafore made in crisp easy care polyester / cotton fabric, complete with back tie ribbon fastenings and pretty trim at the hem. 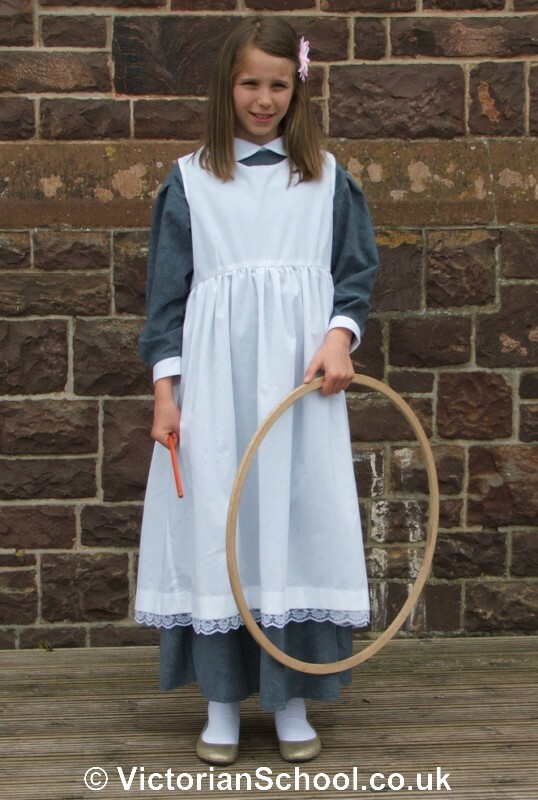 The dress pictured is not included, but is available separately, or you can wear the pinafore over your own dress. This is a quality garment that looks the part and will last well through repeated use. Suitable for Victorian and book days, drama and historical events, it is also a useful practical garment that helps keep other clothes clean. The style of the smock is close to that of an original Victorian costume. As the garment is made by hand, the trim varies slightly, and adds to the authentic styling from a time when each garment would have been individually handstitched. Handmade in England. Smock only. The dress is not included but is available separately.